Do You Need a Nursing Degree to be a Paramedic? Although the alphabet soup of abbreviations that permeates medical designations, academic degrees and virtually every other facet of modern life makes it easy to get confused, a person does not need a nursing degree to be a paramedic. While both paramedic and nurse appear on U.S. News and World Report’s list of Best Health Care Jobs, they are two distinct professions with their own responsibilities and requirements. Paramedics are emergency medical responders who go out into the field to assist patients in need of immediate help and deliver potentially life-saving care while transporting them to the nearest hospital. When the ambulance arrives at the scene of a car accident, medical emergency or fire, there is a good chance that a paramedic is aboard. Not every emergency medical responder is a paramedic. Like most professions, emergency medical responders have a hierarchy dictated by a combination of education and experience. Paramedics sit at the top of the emergency medical responder hierarchy. Of professionals whose regular job it is to respond to medical emergencies,paramedics have the most training. The National Association of Emergency Medical Technicians explains that paramedics are capable of performing noninvasive, invasive and pharmacological interventions to benefit the patients in their care. What Training is Required to Become a Paramedic? Many paramedics begin as emergency medical responders and work their way up through the ranks by expanding their training with accredited professional certifications as they get more experience. 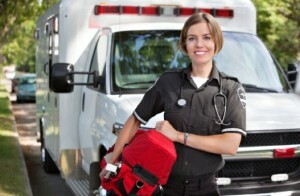 Some choose to meet the education requirements for paramedic by taking a one-year professional certification course. Others decide to earn a two-year Associate of Applied Science in Emergency Medical Technician Paramedic degree. All paramedics must pass either the National Registry of Emergency Medical Technicians exam or their state’s equivalent to become licensed. While nurses are expected to respond to an emergency that occurs in their vicinity, their job generally involves caring for patients in a professional setting as part of a team of health care professionals. Nursing World notes that there are actually several kinds of nurses. Registered nurses are probably the best match for a layperson’s conception of a nurse. They are able to conduct triage, perform physical exams, take health histories, administer medications, perform wound care and generally coordinate patient care. Licensed practical nurses have less training, but can provide basic patient care under the supervision of a registered nurse or physician. In contrast, advanced practice registered nurses have sought further education and are capable of meeting more sophisticated needs. Examples of advanced practice registered nurses include certified registered nurse anesthesiologists, certified nurse-midwives, clinical nurse specialists and nurse practitioners. What Training is Required to Become a Nurse? There are multiple paths to becoming a nurse. To become licensed practical nurses, students enroll in a one-year program at a community college or medical institution. After completing the program, they must pass the National Council Licensure Exam for Practical Nurses. Becoming a registered nurse involves earning a two-year associate degree in nursing or a more extensive four-year Bachelor of Science in Nursing degree. Once students have completed their degree program, they must successfully pass the National Council Licensure Exam for Registered Nurses. Advance practice registered nurses are generally registered nurses who have continued their education at the graduate level, earning either a master’s or doctoral degree. With the growing demand for health care, paramedics and nurses, like other medical professionals, are enjoying a multitude of career opportunities. But, they are not competing for the same positions. Although both professions are in the realm of health care, they have different responsibilities and training requirements. An individual does not need to hold a nursing degree to be a paramedic.